Sunday, August 30th was the 72nd birthday of one of America's greatest cartoonists, Robert Crumb. Though best known for his work in the 1960s underground comix scene and his iconic characters like Fritz the Cat, Mr. Natural (and his disciple/victim, Flakey Foont) Crumb also is a musician -- and one with real vision. Basically, he's a devotee of old jazz, blues and hillbilly music from the 78 rmp era. He's created several decks of cards featuring his portraits of his early musical heros. Around the same time, Crumb started his own band. There were no musical influences around me at all but I remember having this really strong urge to make music. I was always fooling around with music. When I met my first wife she was part of the folk music scene in Cleveland so I kind of appropriated her guitar and started figuring out a few chords. Then when I moved to San Francisco in ‘67 it was the first time I got together with other guys who were serious about playing old time music and it was still the folk era, so the jug band thing had some popularity. So I started fooling around with these guys and we became The Cheap Suit Serenaders. So happy belated birthday, Mr. Crumb. I salute you with your own songs. A lot of people call this next one "Pink Burrito," though its real name is "Get a Load of This." Another favorite, the Serenaders' cover of a 1931 Henry Roy song about a cat. 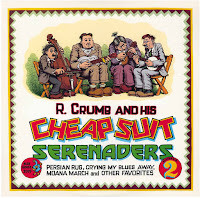 Crumb sometimes collaborates with the New York-based East River String Band. Here's a live song. 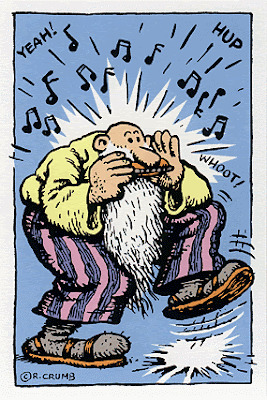 Crumb moved to France in the early '90s. He became enamored of the French musette music of the 1930s and by end of the decade he was playing with a group called Les Primitifs du Future, with who he released an album in 2000 called World Musette. Get a load of this!